The Sponge: Whisk the eggs and sugar together in a mixing bowl until the mixture doubles in volume. Sieve together the flour and cocoa powder and add to the egg and sugar mix. Stir through gently, taking care to ensure the mixture stays light and airy. Mascarpone cream: Mix the egg yolk, sugar and vanilla essence in a bowl until pale and smooth. 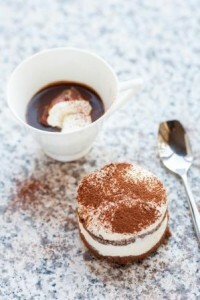 Add the mascarpone and mix well to a creamy consistency, adding a little cream if the mixture is too thick. 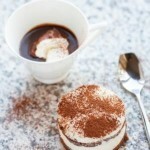 Chocolate cream: Whisk the double cream in a separate bowl and fold in the grated chocolate. Allow the sponge to cool, then cut into desired shapes to fit into individual glasses or bowls. Place a layer of sponge on the base of each and soak with a little of the coffee syrup. Add a layer of mascarpone cream, more sponge then another layer of mascarpone cream. Layer the top with chocolate cream and finish by dusting with cocoa powder.